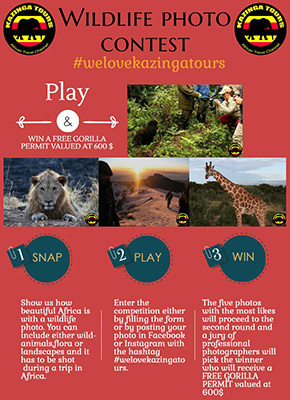 Photo Contest - Win a FREE gorilla permit! The Wildlife Photo Contest starts NOW. Share with us and with your friends the best wildlife photos you shot in Africa and win a FREE Gorilla permit (for Uganda, valued at USD 600). 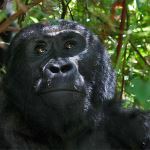 Show to everyone around the world how beautiful and unique is Africa and win this unique prize of tracking these beautiful in the deep Jungles of Uganda. You just have to share your best photos and ask your friends to show their appreciation. #### UPDATE ### The Wildlife Photo Contest is finished. The winner will be announced soon!! The Rwanda Development Board decided to increase the price for the Gorilla Permits in Rwanda from USD 750 to USD 1.500 from 6 May 2017. Click here to find the official annoucement. When you also visit Nyungwe Forest and/or Akagera National Park with a minimum of in total 3 days, you will get a discount of 30% on the Gorilla Permit. 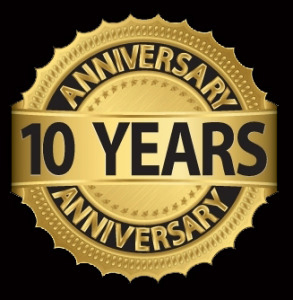 We are proud to celebrate 10 years this year! Kazinga Tours was started on 30 June 2006 by Felex Musinguzi from Uganda and Vincent van ‘t Hof from the Netherlands. And this is 10 years ago already! In these 10 years we have organized over 1500 trips to Uganda, Rwanda and Tanzania. And over 6000 clients enjoyed our services. The fast majority of them are very satisfied, resulting in 5 stars on TripAdvisor! We celebrated our 10 years with a party in Kampala. Invited were all our staff members, formal staff members, guides and other important persons for Kazinga Tours. 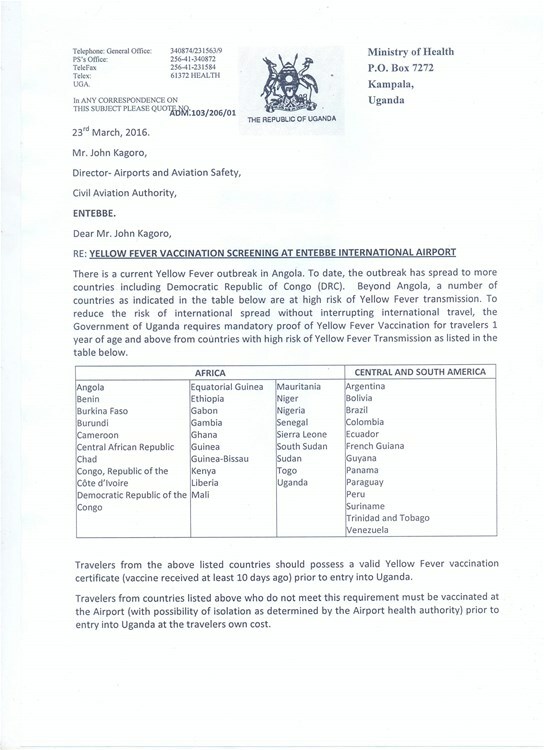 The government of Uganda requires mandatory proof of Yellow Fever Vaccination for travelers 1 years of age and above. 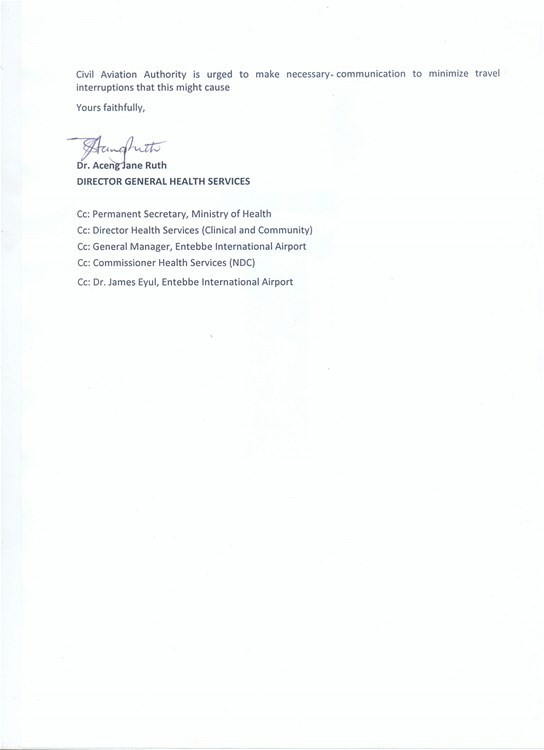 To enlarge the official statement of the Ministery of Health, please click: page 1 - page 2. 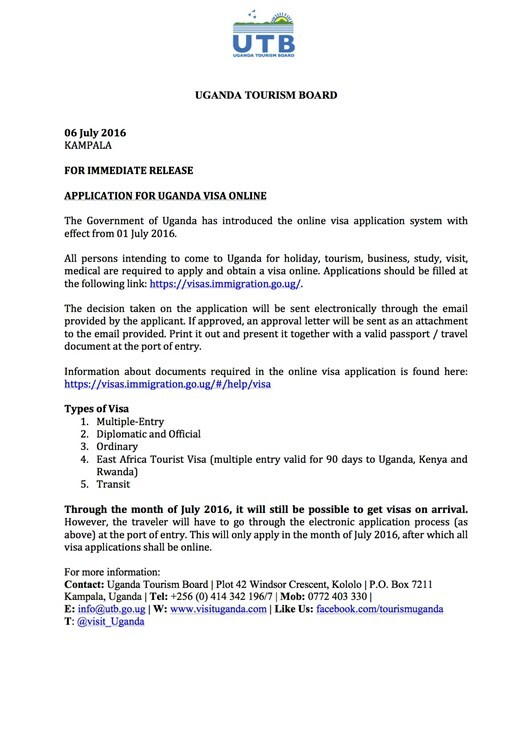 For 2016 we have a Low Season Discount for the Gorilla Permits in Uganda. On 10 & 11 January 2015 Kazinga Tours have been present on the Amsterdam Fair for Special Journeys (Amsterdamse Vakantiebeurs voor Speciale Reizen). Please contact us if you have missed the presentations, and you would like to have information about it! Seven lions, two males and five females, are being transported from South Africa and will arrive by air in Rwanda, where they will be taken and released after a two-week quarantine into the eastern Akagera National Park. Lions will return to Rwanda for the first time in more than two decades after the endangered animal was wiped out in Rwanda's human genocide. Lions in Rwanda were wiped out during the 1994 genocide, which left an estimated 800,000 people dead. Fleeing refugees and displaced people occupied part of the park, with the lion being driven out or killed as people tried to protect their livestock. As part of preparations for the re-introduction, the Akagera park team worked with nearby communities to promote harmonious co-existence with lions. The lions are coming from "relatively small, confined reserves where it is necessary to occasionally remove surplus lions" in South Africa's KwaZulu-Natal province. The western African lion subpopulation is listed as "critically endangered" due to over-hunting and dwindling prey.